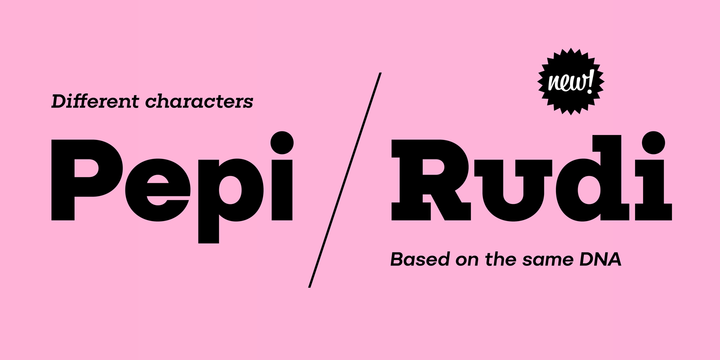 Pepi/Rudi is a contemporary typeface created by Tomáš Brousil and published by Suitcase Type Foundry which was inspired by playful experimentation with basic geometric shapes. It is available in two widths each with 10 styles (from Hair to Ultra) and their italics. This versatile font it works great on display, packaging, logotype etc. Price: startinfrom $39 for one font to $599 all 40 fonts. A font description published on Tuesday, April 4th, 2017 in Fonts, Suitcase Type Foundry by Alexandra that has 5,319 views.